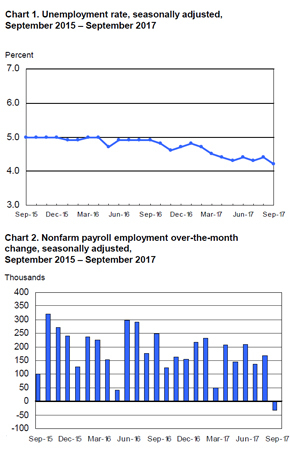 U.S. nonfarm businesses lost 33,000 positions in September, according to the monthly employment report released today by the Bureau of Labor Statistics. Over the past year, the country has added an average of 172,000 jobs per month. This is the first time payrolls have registered a decline since 2010. The BLS attributed much of the decline to the impacts of Hurricanes Irma and Harvey. Economists had estimated job gains of 80,000 for September, Bloomberg reported. The unemployment rate dropped to 4.2 percent in September, falling 0.2 percentage points from August. Also, the number of unemployed persons decreased by 331,000 to settle at 6.8 million for September. Average hourly wages for private nonfarm employees increased by 12 cents in September to reach $26.55. Over the year, average hourly earnings have increased by 2.9 percent. The Federal Reserve has indicated that it is looking for wage growth as a signal to raise interest rates, which, last month, it said it would increase one more time by the end of this year, according to Bloomberg. Economists expect the rate hike to come in December. Food services and drinking places employment was most affected by the impacts of the hurricanes, shedding 105,000 jobs in September. Over the past year, the industry has gained 24,000 positions per month, on average. Healthcare added 23,000 jobs. Ambulatory care gained 25,000 positions, though employment at nursing care facilities declined by 9,000. Transportation and warehousing added 22,000 jobs in September, while financial services gained 10,000 positions. Professional and business services added 13,000 jobs. Insurance carriers and related activities added 11,000 jobs during the month, with much of that sector’s employment gain due to hurricane recovery efforts, the BLS noted. Manufacturing employment was essentially unchanged in September.